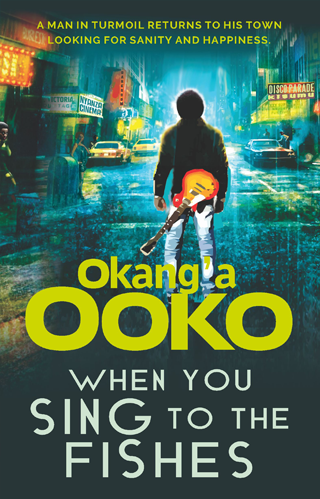 Guitarist Otis Dundos is back in Kisumu, the addictive and possessive lakeside town. Back in the ‘80s, he was the Urban Benga guitar legend. His commercially potent mix of hard benga and lofty rumba was loud with a culture surrounding it, and a cult-like following. It ignited an entire generation of music fans. It made him rich and famous. When he left Kisumu twenty years ago, it was a sudden unpleasant event. Everything ended in tragedy. He was twenty-nine years and at his peak . Today he still is the artsy man: the musician, the guitarist. People have died fast; the men and women who helped him make music… they have all died or wasted away. Is he about ready to follow suit? What is left? The past has unfulfilled dreams, good life, nice cars, easy money, expensive perfumes, glamourous women, living on the road and in the studio. And conniving band mates, thieving promoters and clever pirates. The present is bearable but holds no promise: he is forty-seven. If he has to accept his forced retirement, he has to learn to be a local Kisumuan, not the famous name. He reminisces about the romantic encounters of ‘70s. The future is uncertain. He is searching for sanity and happiness. Happiness? In Kisumu lives the woman whose unfulfilled love still dwells his heart. But his mind is too bamboozled to even think.